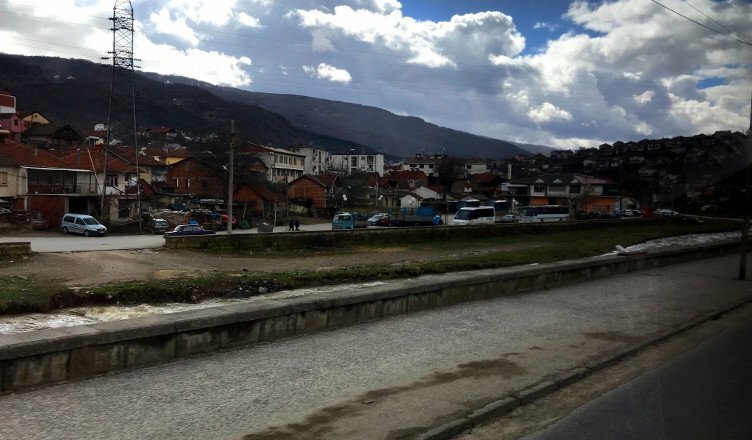 One of the cheapest ways to get from Bulgaria to Macedonia is by bus. I’ve become accustomed to traveling by bus in Europe, so when planning this trip, taking a bus seemed like the most reasonable thing to do. It was only $18 one way, though it’s a 6 hour bus ride. But it’s not without its interesting little things. The bus departs from Serdika bus station, according to the ticket. But when our cab driver dropped us off (after taking an unnecessary detour through a traffic circle to get an extra lev out of the fare), we realized we were definitely not in the right place. A helpful guy pointed us to the bus parking lot across the street. The parking lot across the street had a lot of buses but no information about which bus was going where. After walking around aimlessly through the kiosks of travel companies, some girl mercifully pointed us in the right direction. The lady inside the ticket office of our bus company told us where to wait for the bus. No one checked our tickets. We just loaded our bags in the undercarriage and sat on the bus. The driver counted everyone and must have mentally checked off the people on the bus based on our assigned seats. The bus has WiFi, like some miracle of technology, but the bus bathroom is locked. Some guy asked the bus driver to stop so he could use the bathroom. He just pulled over the side of the road. We stopped at another roadside area where our driver unloaded black bags into a white van. The music in the bus is an 80s night playlist. Every time the driver speaks it sounds like he’s yelling angrily but I don’t know if that’s how he speaks. I definitely don’t know what he’s saying. We pulled over so everyone could use the bathroom and have a smoke. The bathroom was .50 lev and had toilet paper. Thank God for the small things. The stray dogs outside stood patiently outside the bus door and people pet them. We gave them the last of our Bulgarian pastries. Stopped at the border and had to give up our passports to the immigration agent from Bulgaria. After waiting 15 minutes, the driver gave the stack of passports to one of the passengers to hand back to everyone. That seems unwise. Drove up 50 feet and had to do the same thing with the Macedonia border control agent. The passenger handing out passports smiled at us when he said “American?” We were the only two passports in the stack that weren’t red. We definitely picked up a hitchhiker at the border and dropped her off 10 or 15 minutes later. She cackled as she got off the bus at whatever hilarious thing the driver must have yelled threateningly at her. The landscape totally changed the second we crossed the border. The roads in Macedonia are jacked up. It felt like we were sitting in one of those vibrating chairs they used to have at malls. I don’t know if my computer will make it shaken and stirred to Skopje. We stopped again to deliver more black plastic bags. Drug smuggling laws must be super lax here. The Macedonian countryside is more beautiful than Bulgaria, and there’s less trash everywhere. Oh wow, we’re in Skopje ahead of schedule, despite all the bag drops in the country. This place looks civilized as hell. Bus stations in Germany wish they were this nice. Macedonia is already the best.